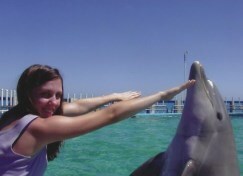 For one incredible three-week stretch in between high school and college, I was a dolphin trainer. At a research facility in Honolulu, I assisted marine biologists who were studying the ability of these amazing creatures to identify, compare, and match objects using only echolocation. I smelled like fish for weeks after I left, but it was totally worth it. Echolocation is fascinating. Sound signals are sent out from a point of origin, bounce off everything they hit, and the echoes return with data about the surrounding environment, which can then be translated into useful information for navigation and decision making. Many animals echolocate, some humans have figured out how to do it, submarines call it sonar, and in health care we call it ultrasonography. It’s a special kind of feedback loop; while many feedback loops are intended to change behavior (like digital speed limit signs that warn motorists of their speeding), echolocation is a kind of feedback loop that is more about direction change and situation analysis. Which brings me to my point: what if the health care system could echolocate? What if it could be in a constant two-way exchange with patients and communities, identifying obstacles to good health, making course corrections, and using the data to inform decisions? The potential is dizzying. Finding a way to introduce more and better feedback loops into health care is something that’s been on our mind at CCMU. We see a great need for engaging patients—especially vulnerable patients—in delivery system and payment reform, so that their needs, priorities, and experiences are reflected in both the process and outcomes. But, it’s not enough to just gather that feedback; it’s important that we then use it to guide our decisions and direction, and communicate back to patients about how we’re being responsive to their input. It’s also important we ask for feedback regularly—not just at the beginning or the end. As we move forward in Colorado’s health systems change efforts, it’d be nice to know we’re not moving forward blindly. Heck, it’d be nice to know we’re moving forward, and not backwards or sideways. Feedback loops aren’t a new-fangled idea, just one the health care system isn’t using all that effectively yet. So, I’m looking forward to helping that process along. It’s that or head back to my dolphin-training roots, but I’m pretty out of practice at this point.